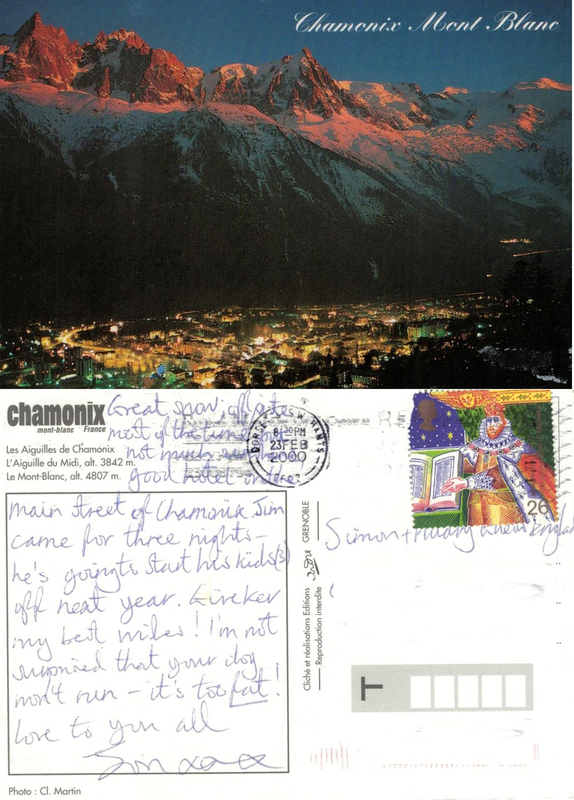 This entry was posted in autobiography, France, Friendship, holidays, Life, Postcards, Travel, writing and tagged Alps, Chamonix, France, friends, friendship, off-piste, piste, postcards, skiing, snow, status updates, winter. Bookmark the permalink. I think you sent me a Christmas card with your lovely sheepdog and family in the picture, probably from a trip to the Lake District, as you did around then – they were great cards, reminding me of friends I didn’t see often enough, and your children who were delightful in character, and the way they changed as they grew up. Cards, and postcards, are fantastic, and I don’t send them enough. I think your blog has inspired me to correct that. Thanks for this great memory. PS I didn’t have a French stamp, so I posted it on the way home to Wales, I think.